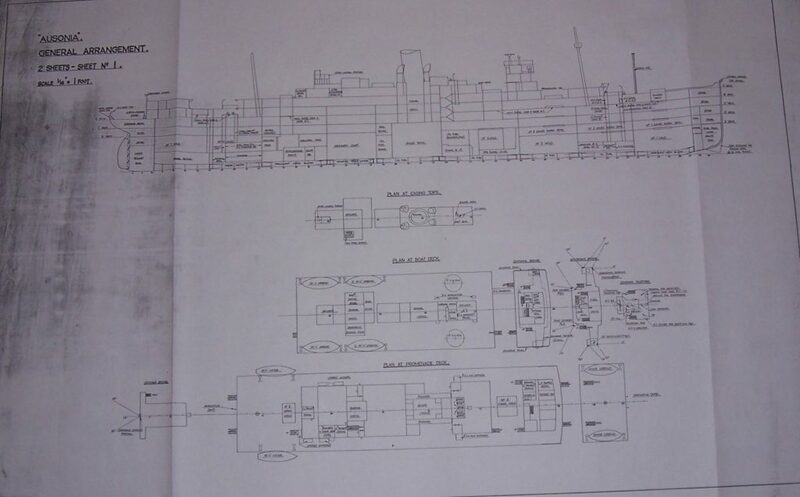 To build a scale model of the Ausonia I would have to rely on the General Arrangement ships plans of her sister ship, HMS Artifex for details of her structure and fittings for when she was a Heavy Repair Ship. Although the two ships were not identical, this was the best that I could do as I was unable to locate any plans for the Ausonia from any other source. 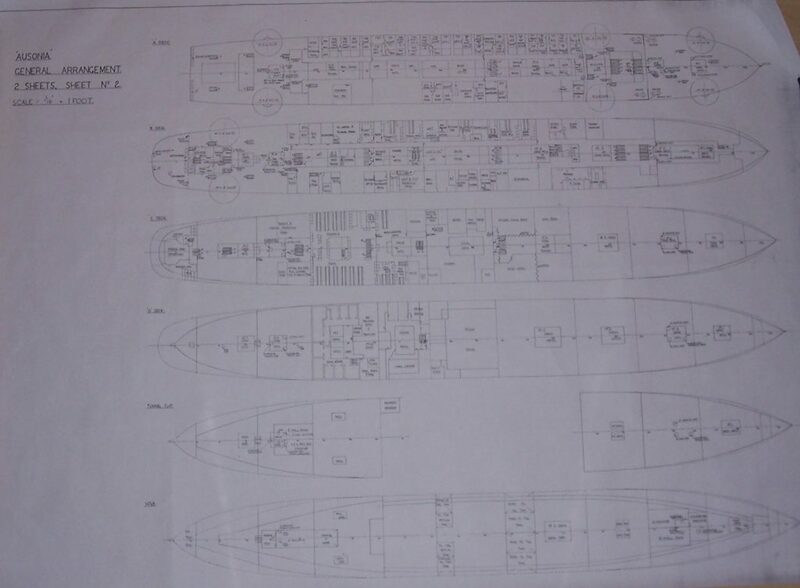 The National Maritime Museum held the plans for the Ausonia’s hull and details of when she had been converted to an Armed Merchant Cruiser so these were ordered along with the General Arrangement plans for HMS Artifex. 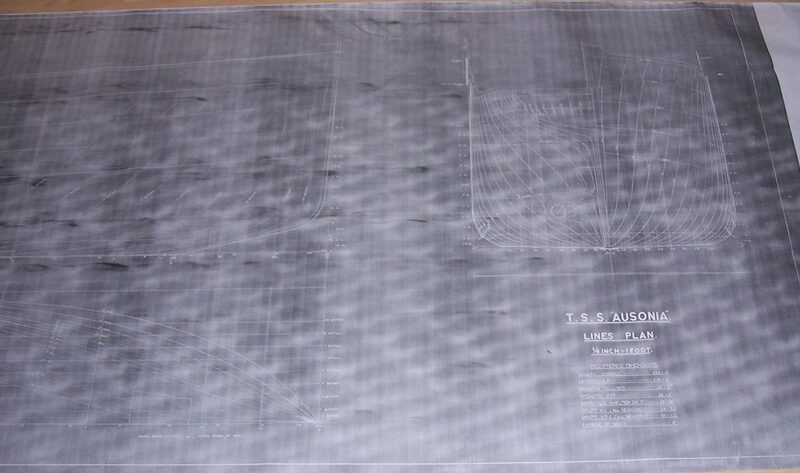 The set of 12 sheets for Artifex show the ship as she was fitted out in May 1944, on completion of her conversion to repair ship at Devonport. I had decided to build the model to a scale of 1/128 which means that every 12” on the full size ship, equates to 3/32” on the model. Not the normal scale for a model ship, which is generally 1/96 scale, but as the hull of Ausonia was 538 feet, when scaled down to 1/128 scale, would give me a manageable model length of 52”. Each plan was reduced in size to the same scale that my model would be built to, that way I would able to take measurements directly from the plans themselves. 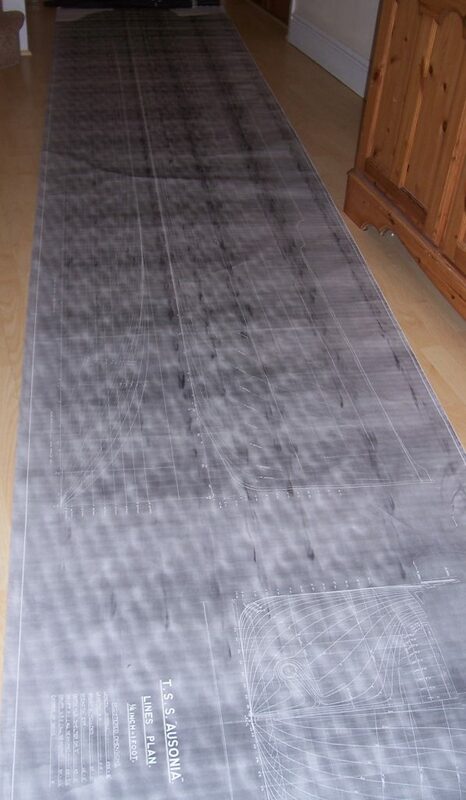 The hull blue prints were drawn in 1/48 scale or ¼” equals 1 foot and the majority of the General Arrangement plans in 1/96 scale or 1/8” equals 1 foot. 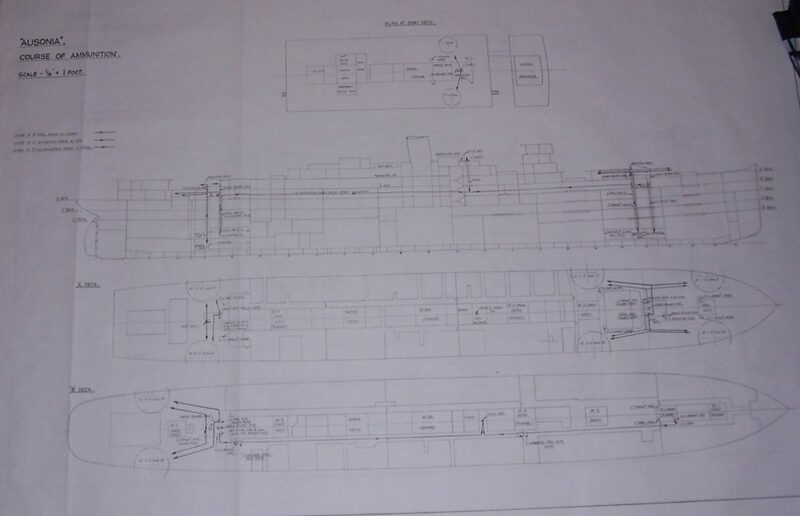 I located a set of plans showing the rig and wireless installation for HMS Ausonia as she was fitted in May 1944 on completion of her conversion to repair ship at Portsmouth and these were purchased along with the rig and wireless installation plans for HMS Alaunia as she was fitted in August 1945. 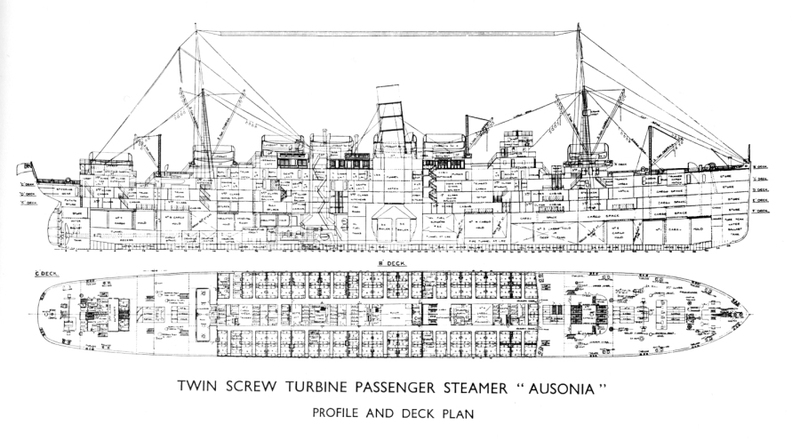 The plans for the Alaunia were brought to compare the two sets of rigging as I felt that the Ausonia plans may not show the latest modifications that had been introduced in late 1945. 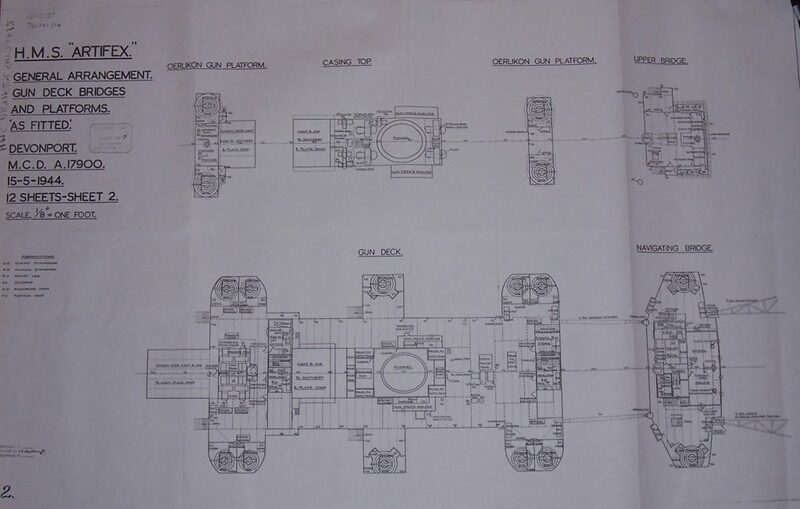 The General Arrangement plans showing HMS Ausonia as she was fitted out as an Armed Merchant Cruiser in 1939, I brought only out of interest as I was intrigued to know the positions of the 6 inch guns and depth charge rails.